The summer of 2014 – the anticipation of another exciting Baja Spectacular increased. It would be the twentieth such event and veterans shared their memorable fish stories of past tournaments. As is usual in these cases, their enthusiasm was contagious! The growing group of old timers multiplied, as did the numbers of newbie’s craving for more, bigger and different fish to catch, so much so that by the end of August, the class of 2014 had grown to near capacity. Perhaps the large numbers were inflamed by an epic tuna bite in Southern California as well. Then, in mid-September, Hurricane Odile slammed into Baja’s tip and the news was grim. Los Cabos airport was thrashed, flights were cancelled, many homes and businesses were damaged or destroyed; even worse, there were fatalities. For the first few weeks, chaos reigned as local, state and national government authorities assessed the damage but the Mexican government responded with a massive recovery effort that restored order and within a few weeks the airport reopened and flights were re-established. 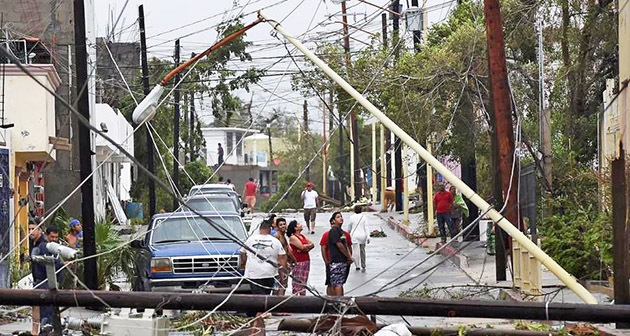 Remarkably, the East Cape itself sustained very little damage – the most damaging hurricane in Cabo’s history had barely missed it. After briefly considering cancelling the event, the decision was made that the 20th Annual Palmas de Cortez Fall Spectacular would be held! The first night around the spectacular infinity pool and bar area, the Sea of Cortez glimmered and reflected like a mirror under the setting Baja sun. Palmas de Cortez host Chucky Van Wormer greeted the group with a broad smile reminiscent of his father, Bobby. 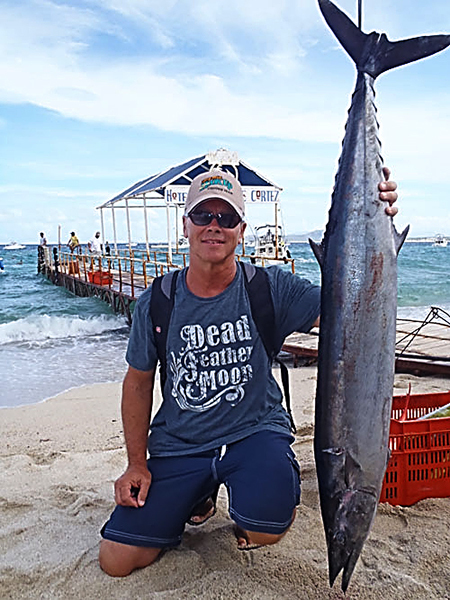 “Wahoo and tuna fishing was some of the best we have seen in the 20 years of the event,” marveled Pete Gray later. 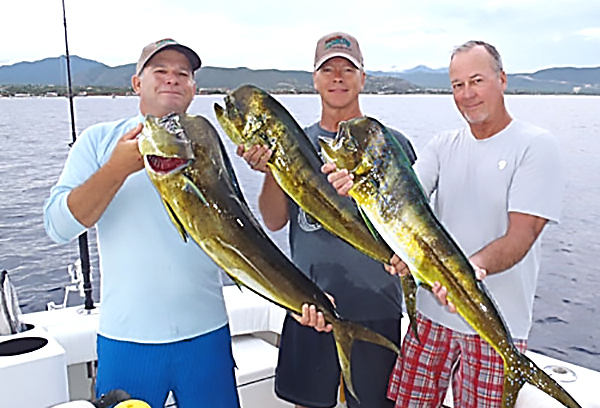 Fishing aboard Jen Wren III – a tricked-out 35-foot Cabo – with owner and friend, Mark Rayor and his buddies John, Mark and Jim, Rayor was on a “busman’s holiday” (sort of) with his crew, Captain Chuy and Diego. The run was long – almost 40 miles south – to the productive area for good wahoo and tuna fishing, but it paid off! The first day … non-stop action! The expert crew didn’t miss a beat. They targeted wahoo first and anglers were rewarded with three up to 25-pounds on Marauders and Rapalas. Next stop, the nearby tuna grounds where the schoolie-sized yellowfin tuna (30+ pounders) inhaled nearly every sardina that hit the water, going light to get the bite that outlasted the crew whose backs and arms ached when they finally returned the tackle to the rack. Team Jen Wren boats are a turn-key operation, providing top-of-the-line gear in excellent condition, a huge bonus for the traveling angler. They are conscientious in the care of the catch, immediately bleeding the fish before placing it in large iced hold until it is transferred to the East Cape Smoke House for filleting, vacuum packing, smoking and freezing. Chris Moyer and his crew at “Smokey’s” not only have one of the best restaurants in Los Barriles, the fish processing is top of the line! They even have insulated fish boxes available for you to take your catch home, in case you choose not to bring a cooler. 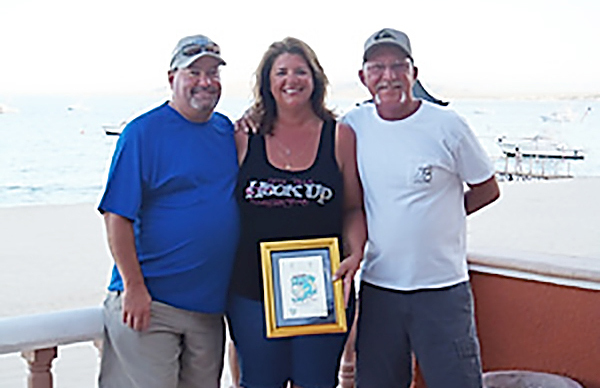 Winner of the 2014 tournament was “Team Nini” with Woody and Linda Cunrod from Sacramento racking up 256 points and taking home a trophy, two custom Makaira Pulling Lures and a return trip to the Palmas de Cortez to defend their title. “Team Sons of Go Ugly Early,” hailing from Orange County, collected 207 points earning them Second Place with a trophy, custom Makaira Pulling Lures and gift certificates to Fisherman’s Landing Tackle. Third Place went to “Team Pocket Ducks” with Chris Moyer from Smokey’s and Frank Fink, owner of the beautiful 35-foot Cabo charter boat, El Regalo. Scoring 140 points, they took home a trophy, Makaira Pulling Lures and certificates to Fisherman’s Landing Tackle. 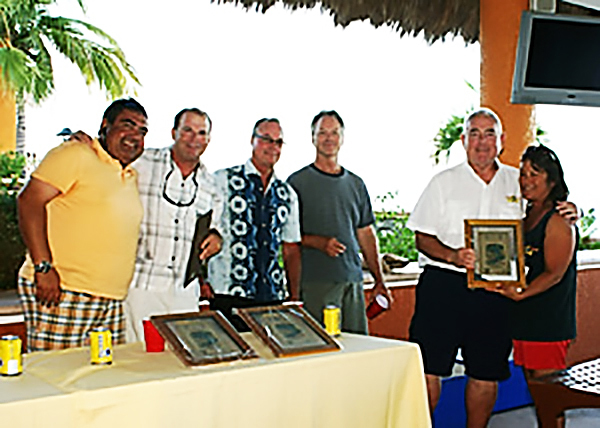 Most Billfish Released Award was given to “Team No Sabe Nada” and Tom and Lou who have been to 19 of the 20 tournaments at Palmas. They won a trophy, Makaira Pulling Lure and a gift certificate for a pair of Maui Jim Sunglasses. “Team Los Rubios” received Honorable Mention for returning after a 7-year absence. Team leader Chris says he will be back next year. This year’s Fall Spectacular Fun Tournament will be held October 8th to 12th, 2015. Thanks to George Weir Asphalt in Escondido, it will be even be better! All an angler has to do is pre-register with Let’s Talk Hookup and be staying at Palmas de Cortez to qualify. Plus there will be other prizes, including a return trip to Palmas de Cortez. How’s that for pumping up the volume to this already exciting East Cape event? The schedule is October 8-12, 2015 with fishing days Saturday, October 10 and Sunday, October 11. Friday, October 9 will be an “Activities Day” and we will put together packages for our group to enjoy the other great things the East Cape can offer: scuba diving, water fall ATV tours and kayak tours/fishing. Of course participants may also opt to fish an extra day. Space is limited, so don’t delay. Sign up now for the “21st Annual Let’s Talk Hookup/Palmas de Cortez” … dedicated to the memory of our long-time friend — Lou Duchene! Gray promises that you will be hooked! The tournament entry is free – good times included. Call 877-777-TUNA and talk to Eddie or Shannon, book online at www.vanwormerresorts.com or click the banner ad on www.hookup1090.com. 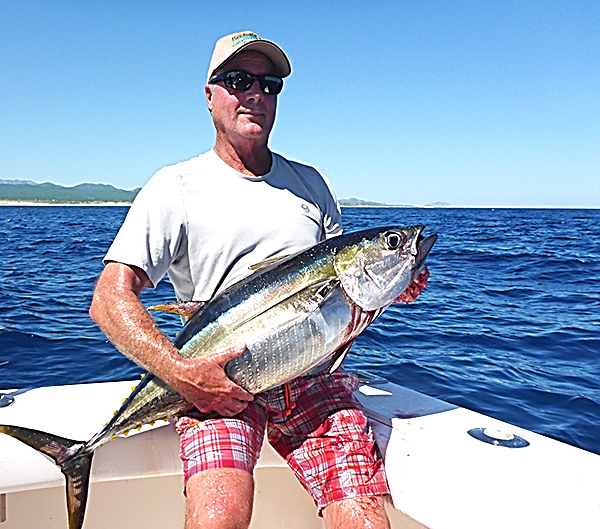 That Baja Guy-Gary Graham, the BD Outdoors Baja Editor, has more than five decades fishing experience off of Southern California and the Baja Peninsula. 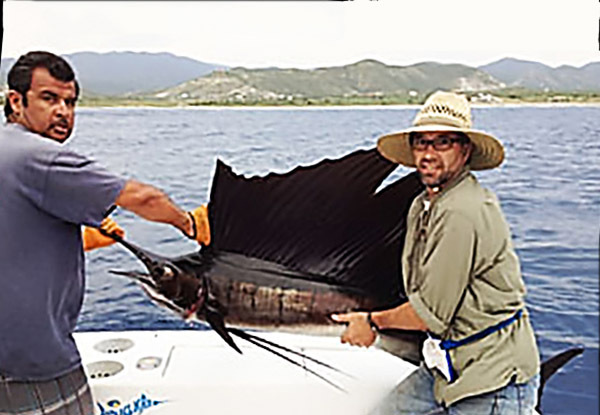 From light tackle and fly up to offshore marlin fishing, Gary has experienced all facets of this fishery. He's set several fly-fishing world records and in his first year as a member of the Tuna Club of Avalon, he received more angling awards than any other first-year member in the club's 109-year history. He's been involved with many California angling clubs and is the Baja California Representative for the International Game Fish Association. Gary's a conservationist as well as a writer and photographer. 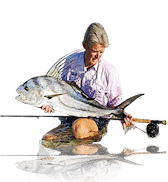 In addition to two books on saltwater fly-fishing, hundreds of his articles and photographs have appeared in publications around the world. Graham has devoted his life to finding new fisheries and developing new techniques — all of which he shares through his guiding, speaking, photography and writing.